Organize your daily life with this multi-purpose Finnhomy X Frame 10-Drawer Rolling Organizer Cart. This handy cart measures 12.8" D x 15.2" W x 33.1" H and has sturdy construction with bright chrome plated metal frame and a top metal shelf for additional work space. 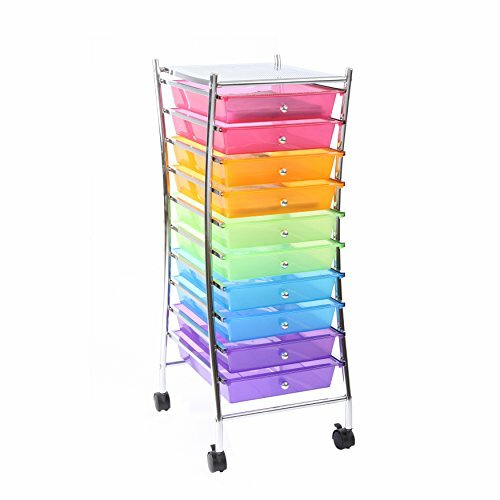 -It has 10 semi-transparent sliding PP drawers (multi color for easy organization) and 4 black rolling casters (2 with lock ) for convenient mobility and 360 degree rotation. -10 small drawer size: 11.25" x 14.37" x 2.36", leaving plenty of space for the storage. -This helpful organizer cart load up to 22lbs and is ideal for kitchen, school, office, workshop,and garage storage and organizer. UNIVERSAL IN USE - 10 standard drawers(11 1/4" x 14 1/3" x 2 1/4") giving you endless organizing options, from crafting and scrapbooking to school supplies and beauty products; Overall Size: D14 1/2" x W12 5/8" x H34 1/4"